In Twin Mirror, you take on the role of an investigative journalist who is returning to his hometown to bury an old friend. It can't be that simple, though, as Sam wakes up in his motel room drenched in blood with no memory of the past night. The first of two gameplay mechanics revealed is Sam's Mind Palace, a place where he can access and recreate memories while also piecing together possible scenarios. It's a bit rusty at first, but soon becomes one of Sam's greatest assets. The second mechanic is something called the Double. Whereas most of us have inner voices that sound like us, Sam's is a classy-yet-sarcastic version of his actual self. However, the Double may not be able to be trusted, and your/Sam's gut will often go against the advice of this mysterious voice. Twin Mirror's first episode (of three) will be available early next year for PC, PlayStation 4, and Xbox One. Almost anyone who has spoken to me knows my extreme exhaustion over the constant bombardment of being-ported-to-Switch announcements. I'm so tired of writing about it, in fact, that I rarely do so. But this game is being ported to the 3DS, so clearly my Switch-aversion doesn't apply here! As announced earlier this year, Luigi's Mansion is coming to the 3DS. The game originally released for the Nintendo GameCube in 2001. 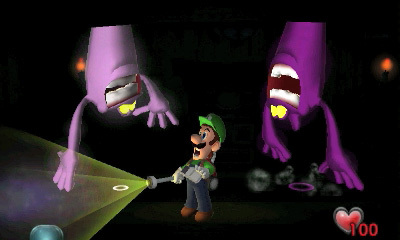 The 3DS remake revisits the spooky mansion with Luigi, armed only with a flashlight and the Poltergust 3000. The goal is to capture ghosts, find treasures, and solve puzzles. Luigi's Mansion on the 3DS will be released on October 12. This version is being marketed as a remake but seems closer to a port with some extra features. The bottom screen becomes a map of the mansion, and the Gallery Battle Mode (exclusive to this version) allows you to re-challenge boss ghosts you've already encountered in the game. The trailer focuses on the logical, young demon hunter Nero. The seeds of a demon tree have been planted in Red Grave City. As the demons begin to take over the city, Nero arrives alongside partner Nico in the Devil Mat Cry motorhome. Nero loses the use of his right arm and relies on Nico to design and build different Devil Breaker arms that can be used strategically against the demons. We have less than a year to wait, and not just by a little: Devil May Cry 5 will be released on March 8, 2019 for PC, Xbox One, and PlayStation 4. Anno 1800's got a release date; three cheers for Anno! Ubisoft's take on a city builder, Anno, has been one of the more quietly underappreciated franchises in the French publisher's catalogue over recent years, but hopefully this new one makes a splash, because it's looking good. Anno 1800 brings the franchise to the industrial revolution, which was a time in which all kinds of technological discoveries were being made, and life for humanity was rapidly improving (at the expense of the environment). In addition to the return of much of the classic Anno gameplay, this new one also offers the ability to send out expeditions to collect resources from all over the world, and a new "workforce" mechanic means managing factories is going to be more complex than ever. Also, you'll be able to get colonial and "settle" South America. This game releases exclusively on PC. The release date (hah, made you read the whole thing before getting to that) is February 26, 2019. So, it's an early one in the new year to look forward to.